Since my teaching brief now includes more sustained instruction in the Jewish tradition, I’ve been further familiarizing myself with some of its significant contributors. To that end, I read Abraham Joshua Heschel’s Maimonides: A Biography. As you no doubt deduced from the title, if you didn’t know already, Maimonides’s proper name is Moses ben Maimon. And if you throw the title of Rabbi on the front (it is accorded to him as an honorific although he was never “ordained” as a rabbi and refused the opportunity because he didn’t think he should earn a living off the Torah), take the first letters, and throw a couple vowels (two ‘a’s) in there to help you pronounce it, you get “Rambam,” which is how he is referred to in the rabbinic tradition. The message of Malachi is as follows: God knows those who fear him and those who do not, and He desires his people to repent and turn back to Him and Torah (Mal. 3:7). If the people do not do as God desires, God will come with judgment as destruction on the people and on the land. Malachi ends his book with a word of Judgment: utter destruction hangs in the balance if the people do not turn. For all intents and purposes, Malachi cries out: “Pay attention!” He pleads with his audience: “Take heed; this is serious!” “Judgment is coming!” Malachi shouts. The question that Malachi leaves us with at the very end of the book is: on whom will judgment fall? Can this sort of God have any credibility for us today in the real world? The unchanging, unaffected, immovable god, who dwells in unapproachable light, can have no credibility for me. What, then, of the Void? Does nothing at all lie beyond the world we see in the news? The year was 1964, at the height of the Civil Rights struggle. William Stringfellow, the young attorney and lay theologian who had recently practiced street law in East Harlem, penned a set of reflections on the vocation of the church in the face of the oppressive principalities and powers of the world. The essay was framed by passages from the "Epistle" to the Hebrews. 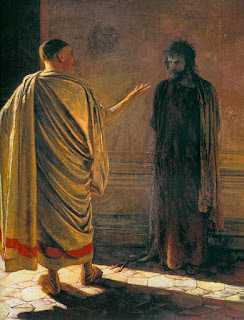 In the passion story, as Stringfellow reads it, Jesus bears the full brunt of condemnation from (if I may be a little anachronistic) the secular Roman authorities and the religious priestly caste that collaborates with Empire. By now, DET readers know that David Congdon (who needs no introduction at DET) has begun an initiative called #TwitterSeminary. This is a great project that brings together serious and sustained reflection on important theological topics with the (perhaps unlikely) medium of Twitter. Unfortunately, some people don't have Twitter accounts and are unable to access the goodness that is #TwitterSeminary. That's why I've been posting my #TwitterSeminary guest lectures here at DET in their entirety. Perhaps you saw my first on Karl Barth, Pacifism, and Just War. 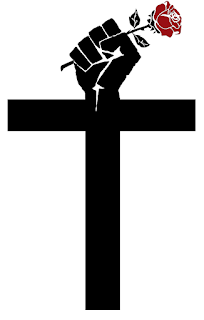 I'm pleased now to bring you another on Christianity and Socialism. It was wonderfully gratifying to see the response to this material from folks on Twitter, so thanks to everyone for their kind words. And if you do have Twitter, you can access all this as a moment. 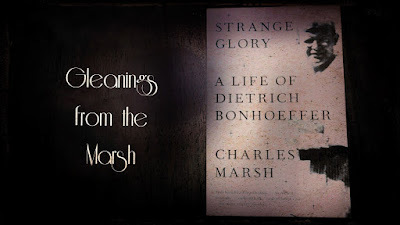 I’ve been wanting to read Marsh’s Strange Glory: A Life of Dietrich Bonhoeffer (Vintage, 2015) since it was first published in 2014. Now that the paperback is out, and selling for ~50pp/$ at a certain online retailer, I knew the time had come. When I started reading the book I, quite naturally, sent out a Tweet about it (see it here if you want) in which I described it as “the only one worth reading by an author whose name starts with ‘m.’” One or two of my friends and colleagues who are Bonhoeffer specialists got in touch to point me to resources that identify flaws in Marsh’s presentation. It’s true, this book is not perfect. However, I stand by my statement—which, admittedly, probably isn’t saying much.